The Stormy Night chapter has a several key choices that make a major impact on how the rest of the Detroit: Become Human plot plays out. This walkthrough will outline all requirements for 100 percent completion of Stormy Night in Detroit: Become Human. This includes all possible endings and how they will impact events going forward. Expect major spoilers ahead, and consider playing through Detroit: Become Human blind and only using guides on future runs. The 100% complete flowchart for Stormy Night. The Detroit: Become Human chapter Stormy Night is likely to serve as players' first glimpses of how truly complicated the game's various mission branches can become. There are a lot of different paths players can take in this chapter, with some choices bouncing between the "good" option where Kara and Alice are close to escape straight into the "bad" path where they're both in imminent danger. The only way to get this ending is to obey Todd when he tells Kara not to move. Either don’t break free and become deviant or do but don’t ever go upstairs to intervene. Just know that if this ending is saved it will have major consequences on how the game plays out moving forward. There will be entire chapters missing. There are multiple ways to get this ending but the common idea between them is that Kara and Alice got out of the house but didn’t get on the bus. To achieve it as part of 100 percent completion, get outside and just stand there. After several seconds Todd will catch up with Kara and Alice and break Kara, drastically altering future events. This ending is possible only if players found the gun in A New Home. Kara must become deviant, then head upstairs to Todd’s room and retrieve the gun. Head into Alice’s room and confront Todd, then win the fight. Kara will shoot and kill Todd, which is likely to be the most popular ending for this chapter. This ending is achieved by finding the gun in A New Home, then becoming deviant at the start of this chapter. Head upstairs and take the gun, then confront Todd in Alice’s room. Win the fight up to the point where Kara must dash for the gun, then fail the QTE. Todd will get the upper hand, but Alice will retrieve the gun and kill him. For this ending to be achieved Kara and Todd must fight in Alice’s room, but the gun cannot be present. Leave it in Todd’s room. Just go into Alice’s room (before or after Todd) and fight him. Win that fight and Kara and Alice will flee to the corridor. Stand there and make not attempt to get away and Todd will break Kara in the corridor. This ending is unlocked by getting away from Todd upstairs, either by fighting or fleeing. When Kara and Alice head downstairs, try the front door but fail the QTE. Todd will catch up to Kara and attack her. Purposely fail all QTEs from this point on and the ending will pop. If Kara heads to the backyard instead of the front door, this ending is impossible, even if they fight downstairs. This is probably the fastest ending to unlock in the chapter. Kara will need to become deviant as soon as Todd tells her to stay put. Head upstairs and choose to lock Alice’s bedroom door, then go out her bedroom window only if it was discovered in A New Home. Nail the QTEs and run for the bus and this ending is unlocked in just a couple short minutes. This ending is achieved multiple ways. The first is to fight with Todd upstairs (without the gun) and win, or fight with him downstairs and win. If Kara wins all her fights with Todd and escapes with Alice, this is the ending players will get. It also requires that players do not escape through Alice’s bedroom window. With Kara and Alice safe in Stormy Night, move on to Broken. 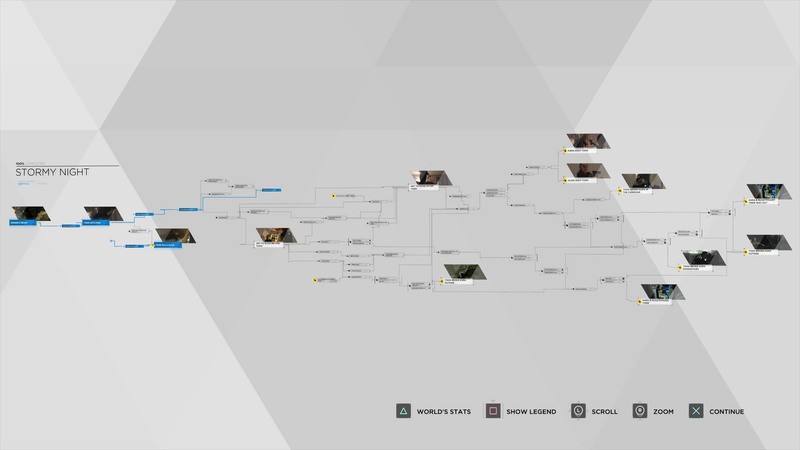 To browse through all our guides for the best possible outcomes, visit our Detroit: Become Human walkthrough and guide. Our focus is on unlocking paths, keeping characters alive, and making sure android and human relationships stay positive where possible.